Pumpkin has a particular affinity with coconut cream, and so is superb in coconut-based curries and soups like this one. Pumpkin and Coconut Cream Vegetarian Thai Soup is menu for vegetarian and most famous of Thailand, it’s easy for cooking and delicious. And then use in period Kin Jay festival. That is good idea for Vegan. 1. In a saucepan, combine the pumpkin, stock or water, ginger, and lemongrass. 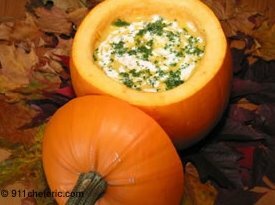 Cover, bring to a boil, reduce the heat to medium-low, and simmer until the pumpkin is very tender, about 12 minutes. Add the scallions and cook briefly. 2. Transfer the contents of the saucepan to a blender or food processor and process until the soup is partially pureed. Pour in half of the coconut cream and process until smooth. 3. Rinse the saucepan and pour the puree into it. Add half of the remaining coconut cream. Season with salt and pepper and heat through without allowing the soup to boil. Taste and adjust the seasoning and squeeze in lime or lemon juice. 4. If using the kaffir lime leaves, fold them in half and, using a sharp knife, trim away the hard central rib. Cut the leaves into threadlike shreds. Ladle the soup into bowls, add the remaining coconut cream, forming a swirl on top of each bowl, and garnish with the lime leaf or zest. Enjoy eating for Pumpkin and Coconut Cream Vegetarian Thai Soup. This is a most delicious soup. I was served it while on an Insight Meditation retreat in Byron Bay, Australia, two weeks ago, and could hardly wait to get home to make it again for myself. I used 4 cups of pumpkin and 2 cups of sweet potato, and the juice of 2 limes. Unfortunately I had to use frozen lemon grass as it is hard to get it fresh in winter in NZ, but it was still good.